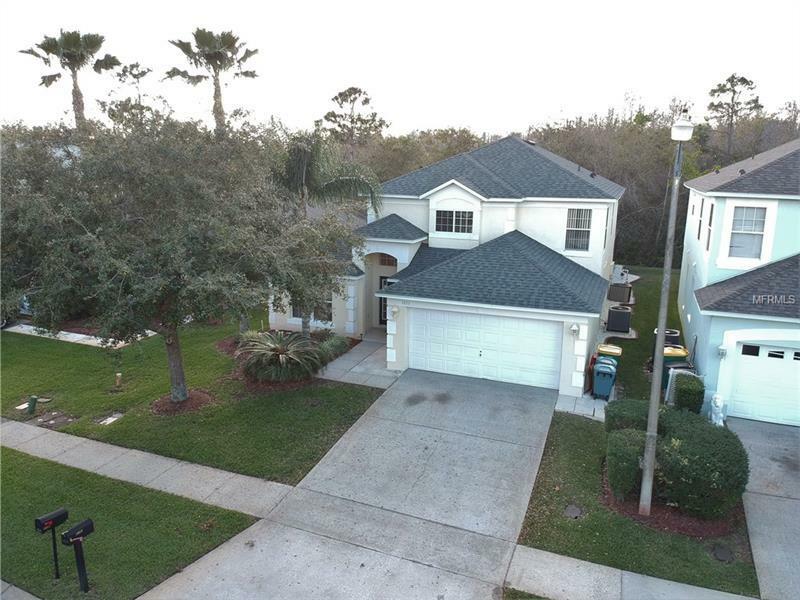 2-Story Executive Pool Home with 5bedrooms/3bathrooms in Popular Lake Berkley Resort. Master plus 1 bedroom downstairs. Master Bath includes Dual Sinks, Garden Tub, Separate Shower, plus Large Walk in Closet and separate Owners Closet. Ceramic Tile throughout home, with exception of bedrooms and staircase. Nice Size Family Room with Impressive Cathedral Ceilings all looking onto an inviting Extended Pool and Deck Area. PRIVACY PLUS offered here with conservation in rear and a West Facing Exposure making an ideal setting for lovely sunsets. Property has NEW A/C, Pool Heater, Carpet, Fresh Paint and a 2 Year old Roof. Updated Kitchen with Cherry Cabinetry, Granite worktops and Stainless Steel Appliances. Community offers Clubhouse with Arcades, Pool Tables and Gym, Oversized Swimming Pool, Jacuzzi, Kiddie's Pool and Play Area, Tennis Courts, numerous Walking Trails, and a welcoming Sandy Beach overlooking Lake Berkley. Lovely setting for a holiday home or permanent residence. Subdivision offers 24/7 Guard Gated Community. Landscaping included in maintenance fees. Conveniently located just behind Medieval Times with easy access to Osceola Pkwy., Greenway, I-4 and Hwy 192. Just a short commute to Orlando International, Disney, Universal, SeaWorld etc. . . This home will not disappoint, put it on your To Do List.